Felyne Jack-o'-Lantern is a Palico Weapon in Monster Hunter World (MHW). 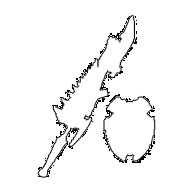 Palico Weapons all have a Melee and Ranged value as well as a Blunt or Severing Attack Type. Unlike human weapons, you cannot upgrade their Palico counter parts.